Gokul Chandra Das comes from a traditional Dhaki family and is known to have taken the Dhak mainstream and introduced it to the world. He received a break when he won a competition judged by Grammy award winner Tanmoy Ghosh. Since then, he has performed at San Francisco, Chicago, New York, Los Angeles, Wellington and Berlin and has also performed with the late Pandit Ravi Shankar and Ustad Zakir Hussain abroad. He achieved a major milestone when in 2009 he became the first dhaki to perform at the famous Hollywood Bowl in Los Angeles, as part of the Ravi Shankar Centre Ensemble, at a show curated by the maestro himself. 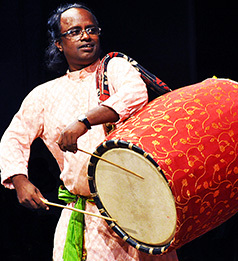 He now plays an integral role in tabla maestro Tanmay Bose’s musical outfit Taaltantra.